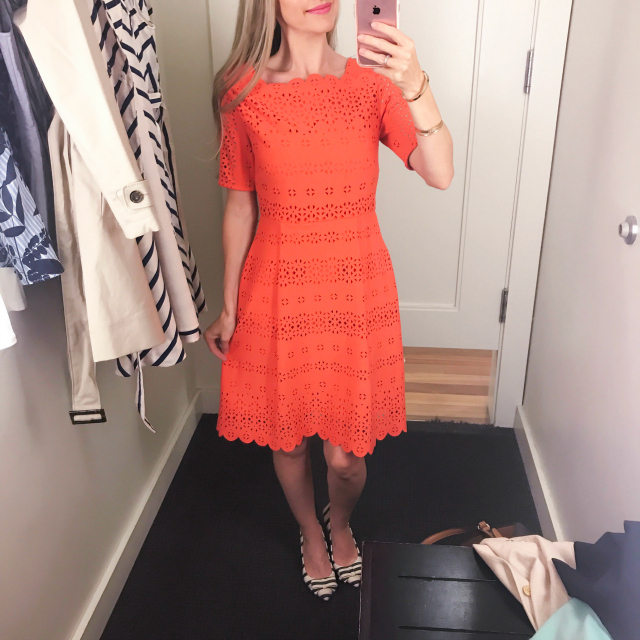 I had the chance to try on a few things recently, and fell in love with a lot of them, so I wanted to share them with you before they start selling out! If you've seen my previous post, you're already familiar with one of the pieces that made its way into my closet. Aka, modern and beautiful pieces for both the office and the weekend that aren't stuffy and boring! Oh, and before we jump in, here's my usual fitting room disclaimer: I apologize in advance for the wonky lighting. I always try my best to capture the true colors of every item to give you an accurate assessment. Sometimes that means I have to brighten them or adjust the colors in post-processing. 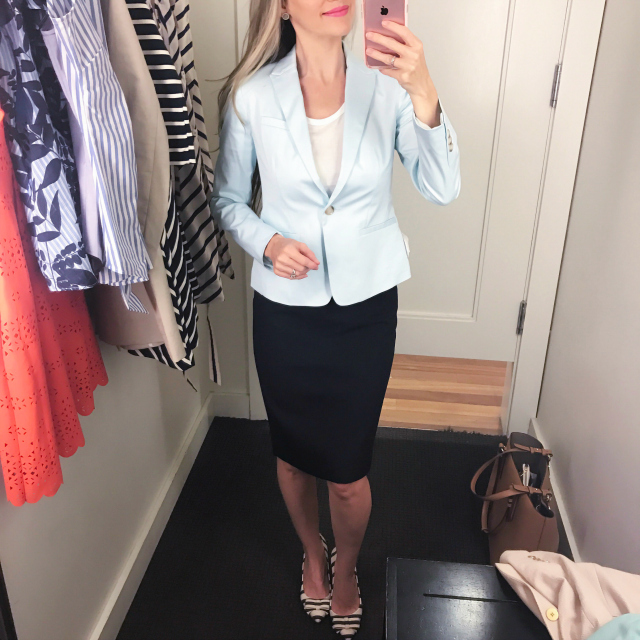 First up is this Sateen One-Button Blazer in the prettiest aqua blue, which is called "island shores" on the BR website. This is such a lovely shade of blue and one that's perfect for a Spring/Summer office look. Pair it with a classic, navy pencil skirt like I'm doing here or with an ivory one to keep the look light and airy. Or, swap out the skirt with some white skinny jeans for a dressy-casual look on the weekend or after-hours. The one-button style looks crisp and sharp and will elevate even a basic white tee, which is what I layered underneath for this look. I'm trying on size 00P, and I'd say it fits true to size with the waist running slightly wide. (For fit reference, I'm 5'2" and about 100 lbs. with measurements 34-25-36.) The sleeves fit nicely, aren't too wide, and the length hits right at the wrist. The blazer itself has a nice weight to it, giving it a structured look, which I prefer with all of my blazers. The fabric has a slight sheen to it but is nice and understated. It's a great-looking blazer in such a lovely, unique color. Love it and would definitely recommend! 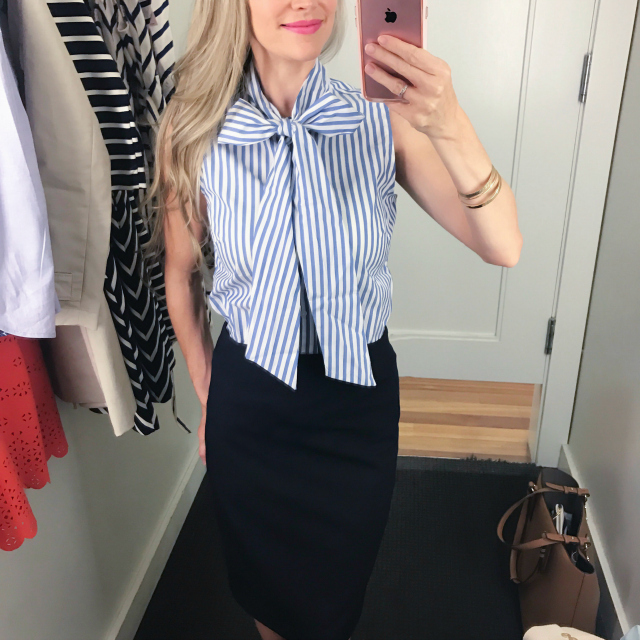 Next I tried this Riley-Fit Bow-Neck Stripe Shirt, which I've been swooning over since I first saw it online a few weeks ago. Blue and white stripes with a bow neck? Yes and yes! It truly didn't disappoint in-person either. I just adore it. It needs a little steaming (you can see some crease marks in the tail of the bow) but apart from that, it's the perfect blend of feminine and sweet with "let's get down to business." 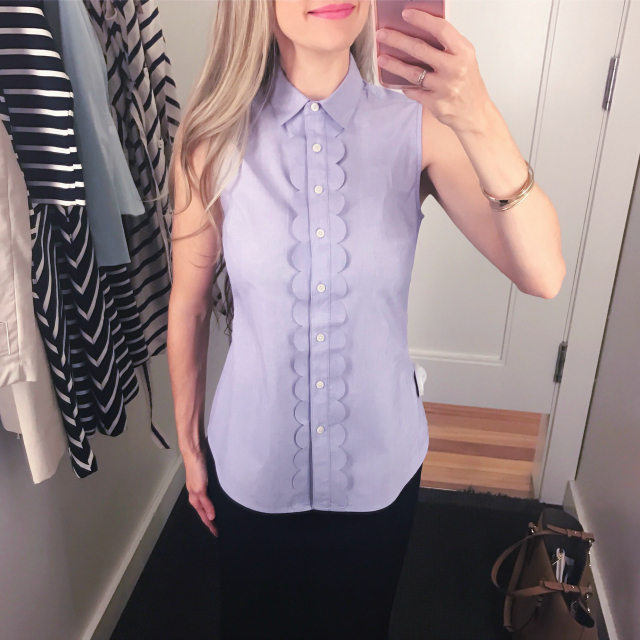 There's no shortage of tie-neck blouses in my wardrobe, and for good reason: I love the style and often wear them either on their own or layered under sweaters, both for office wear or casual wear. I'm trying on size 0, which was the smallest size available in the store. I noticed that petite sizes aren't available for this blouse online either (darn) but this size still fit pretty well, albeit a little wide in the torso. You can see that the sides are bunching out slightly when the blouse is tucked in, which drives me crazy. I'd probably have to slim the sides to ensure a better fit, but that's just my personal preference. That aside, this is one of my favorites! Next up is this Riley-Fit Purple Scallop Shirt in size 00P. This was another immediate favorite. I love just about anything with scalloped detailing, and the scalloped placket on this blouse is just darling. The lavender color is also quite lovely and fresh for a Spring work look. The material is crisp and lightweight and has a very slight stretch to it thanks to the 3% elastane in the otherwise all-cotton fabric. Size 00P fits me well but is slightly tight across the bust. If you have a larger bust, you will want to size up to prevent any pulling or gaping at the buttons. Next is the Double-Breasted Belted Trench in size XXSP. 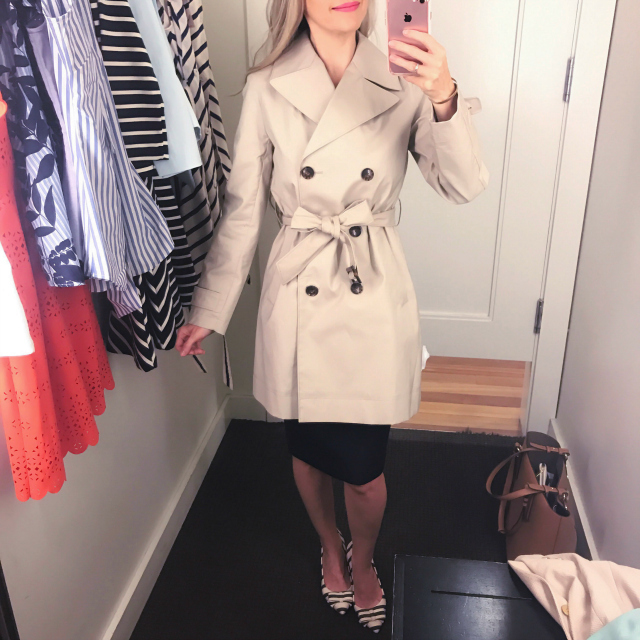 I'm always on the hunt for a classic, well-fitting, petite trench coat. Most trench coats fit really large on me: sleeves are too wide and/or long, waist is too wide and bulky, or the coat itself it too long and swallows me completely. The shape of this one is better than most on me and has some structure to it, however the sleeves and waist are still too wide for my liking, so if you're similar in size to me, you may need to consider investing in alterations. And while I like that this trench has most of the elements of a classic trench, it is missing shoulder epaulets, which I personally prefer on a trench coat. That aside, it is still a great trench and the color is a true beige -- not to light or too dark. The 100% cotton fabric is noticeably stiff to the touch and when trying it on, but this allows the coat to maintain its structure/silhouette, so I can get past it. As far as I can tell, the fabric is not coated or waterproof, so you will want to keep that in mind if you live in a rainy climate or are looking for a waterproof option. Overall, this is nice, lightweight trench if you're looking for a classic, neutral coat to layer over your outfits on chilly days. I love the double-breasted styling and wide, notched collar, and of course, the pockets. Please note: it's dry-clean only. Last up is this striking, vivid coral, laser-cut dress. Unfortunately, I don't know the exact name of it since I can't locate it on the BR website; I'm thinking it's already sold out online. You still may be able to find it in stores, though, like I did. There were several sizes on the rack in my local store, but the smallest available was a size 2. As you can see, it runs wide on me in the waist and hips, so I'd definitely need a size 0. The fit-and-flare silhouette is ladylike and flattering, and the almost-elbow-length sleeves are also nice and modest. And let's talk about the detailing -- so beautiful! The laser-cut lace and the scalloped collar and hem definitely speak my language! I love pretty, feminine details like these. This dress would be perfect for a Spring/Summer wedding, graduation, party, or other special event. It's truly a stand-out dress! There are so many other pieces that are definitely worth checking out. These yellow floral pumps, for example -- so very pretty! I snagged them in size 5 when they popped back in stock online, and can't wait to get them! These pumps have received several glowing reviews on their comfort alone, so I'm optimistic. I hope you found these quick reviews helpful! Let me know which ones are you favorites or if you've snagged anything! Have a great day, and as always, thanks so much for stopping by!